Well, I’ve been back from the 2012 edition of GUADEC for a few days now. Below are some impressions I took away from a week of talks, drinks, beach and friends. As was often commented on during the conference, the GUADEC organizing team did a great job with the organization of the conference. I can’t think of anything that didn’t run smoothly, including, astonishingly, the network. There were times when the wireless was slow but it was never down and there were tons of cables to connect with if one really needed. So, congrats to the GUADEC organizing team. You did a brilliant job. There were a number of notable talks. I was probably most interested in The crowd funding GNOME Development talk as I’m working on a tangentially related project. The Yorba guys, Jim and Adam, did a really nice job presenting the current situation that many Open Source projects find themselves; if you need funds you throw up a donation page and wait for the money to start rolling in… or more frequently, not. They also explored why the current and past crowd funding sites are inadequate for the needs of open source projects. Hopefully they, or someone else, can figure out how to harness the many users out there who wouldn’t mind donating small amounts to various projects they use every day. Then there was Lennart‘s talk. Lennart’s talk called on those working at the user interface layer to help drive development of the entire system, all the way down to the kernel. He acknowledged that this is not always easy (using the experience of those trying to get DBus into the Linux kernel) but chalked most of these issues up to politics. And like any good politician you’ve got to know the procedures to follow. He offered his and Kay’s help to anyone wanting help in this process. For a more detailed description of this talk the german-speaking folks can checkout Andreas’ article or the always-accurate Google translation. Another great talk was the History of GNOME talk given by Jonathan Blandford, Federico Mena Quintero and Dave Mason. Passing around what seemed to be a small baby swaddled in a blanket, they told the story of the early days of GNOME and how it’s gotten to where it is today. It’s always interesting to reminesce but I think the talk had an even more important meaning. Much of the talk focused on how the project had often found itself in trying times or moments. In light of some of the press coverage the GNOME Project received during the conference, this seemed to border on motivational speaking for GNOMErs, which the project may very well have needed. In the end, the ‘baby’ was unswaddeled to reveal our friendly 5 legged goat, GEGL. After the main conference days, the BoFs were up. The one I attended was the GNOME OS session. Slowly it seems, the groundwork is being layed for the often mentioned, rarely defined, GNOME OS. However, it looks like Allan has taken some steps towards defining it by summarizing what was discussed. It was great to meetup with everyone again, especially many of my former Openismus colleagues who’ve mostly dispersed themselves throughout Europe. The RedHat party at the aquarium was definitely one of the social highlights. Also, thanks to the Collabora folks for supplying drinks to us freeloaders at the impromptu beach parties. 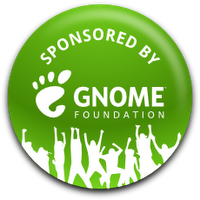 A very big thanks to the GNOME Foundation for sponsoring my trip.